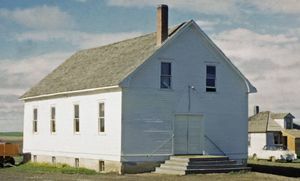 The Woodrow Gospel Chapel in Woodrow, Saskatchewan began services in 1909, and formally organized in 1910 with a membership of 28. The first building was occupied in 1916, with a subsequent building program in 1958. George Reimche is considered the founding leader of the group. 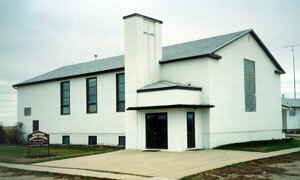 The congregation originated through emigration from North Dakota. Woodrow was originally known as Hoffnungsfeld, and later as Woodrow Mennonite Brethren Church. Other leaders that served prior to 1960 included John Ollenberger, Ludwig Seibel, E. J. Lautermilch and Samuel Sutter. The language of worship is English; the transition from German occurred in the 1930s. The congregation celebrated its 100th anniversary on 26-27 June 2010. At that time the congregation had 42 members. Mennonite Brethren Herald (27 May 1988): 65. Toews, John A. A History of the Mennonite Brethren Church: Pilgrims and Pioneers. Fresno, CA, 1975: 160. Available in full electronic text at: https://archive.org/details/AHistoryOfTheMennoniteBrethrenChurch. Regehr, Jacob I. and Marlene Epp. "Woodrow Gospel Chapel (Woodrow, Saskatchewan, Canada)." Global Anabaptist Mennonite Encyclopedia Online. May 2013. Web. 19 Apr 2019. http://gameo.org/index.php?title=Woodrow_Gospel_Chapel_(Woodrow,_Saskatchewan,_Canada)&oldid=163460. Regehr, Jacob I. and Marlene Epp. (May 2013). Woodrow Gospel Chapel (Woodrow, Saskatchewan, Canada). Global Anabaptist Mennonite Encyclopedia Online. Retrieved 19 April 2019, from http://gameo.org/index.php?title=Woodrow_Gospel_Chapel_(Woodrow,_Saskatchewan,_Canada)&oldid=163460.